Wisdom Personal Checks feature the Hindu symbol for the Brahman, the omnipotent, omnipresent and source of all existence. The symbol, called Om, represents God. It is a pervades life and it is used in everyday life. In addition to the symbol, it is a word or rather a sound, that when properly intoned, resonates throughout the body bringing with it a sense of peace and harmony. It is a mantra or prayer that can be felt to the depths of the soul. 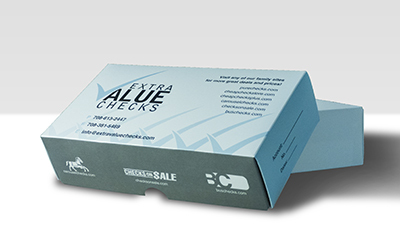 Wisdom Personal Checks are available in both single and duplicate check format. Matching address labels and coordinating checkbook covers are also available.